Sir Ivan Wilzig emerges from his Peacemobile right before his performance of a single from "Here Comes the Sun The Remixes." Photos from Getty Images. IT is a really dark late August night. But the sun is shining. Caught in the sun's rays is a gothic-style castle and grounds situated along a heavily treed winding road in the Hamptons. It is the compound of Sir Ivan Wilzig, businessman, philanthropist, bon vivant, entertainer and recording artist. Visitors who are admitted through the massive gates are swept into a sunny paradise, greeted by a stand of sunflowers and other bright sights. It is a happy place. The occasion, the official record release party for Sir Ivan's latest, the EP “Here Comes the Sun The Remixes.” Here are five different versions of The Beatles' popular ditty recast in the techno style with various riffs from other genres, including disco and sundry instrumental, or rather, computer-generated flourishes. If nothing else, Sir Ivan is a showman. Why have a record release party in a dingy, dark, dank nightclub or nondescript event space when you have sprawling digs on which there is a bridge, moat and arresting views? And so he has not. 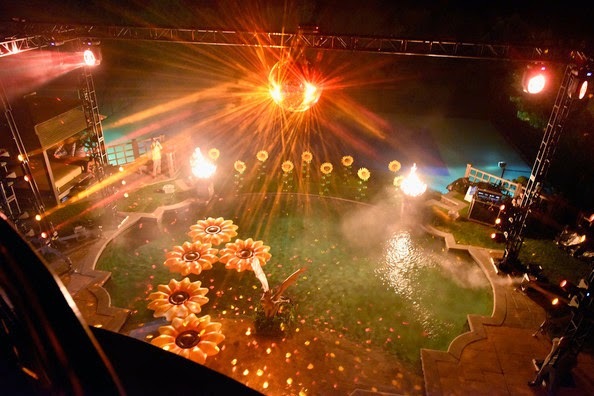 In keeping with the theme of “Here Comes the Sun,” the host strongly urged guests to dress in colors of the sun. To that end, yellow, red and orange abound. This being New York – even in the Hamptons part of it – a few settled for black. Young, hot things in five-inch dresses are navigating five-inch heels, oblivious to the reality that they will come to regret their decision, through the prism of back and foot complaints, before they are out of their 30s. 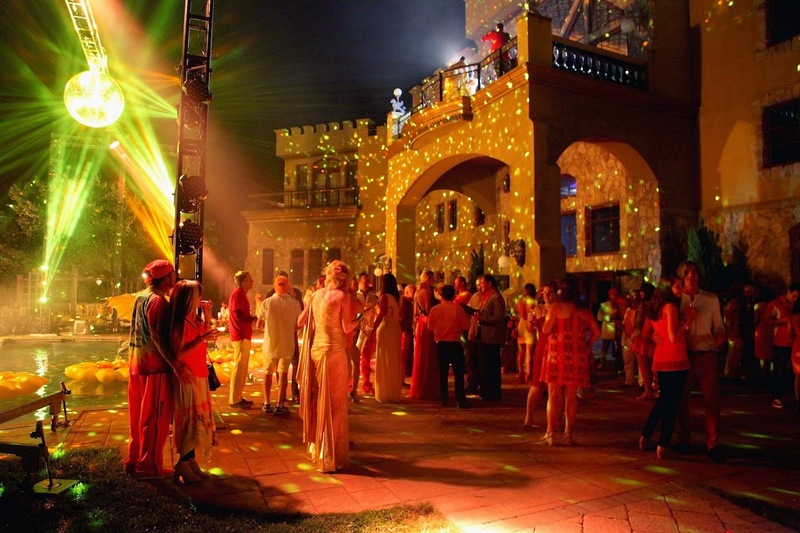 For the most part, though, revelers have adhered to the theme, which even extends to the food. Sunflowers, a welcome sight at Chez Sir Ivan's. Breakfast comes in the form of eggs sunny-side up. Awaiting the famished set for brunch is a wonderful poached salmon. The accompanying dill sauce is a bit difficult to explain away but pairs perfectly with the fish, as does a green salad. A body can take a theme only so far, reason enough to make a case for a green salad with slices of chicken, though even in the dark a sun-dried tomato can be glimpsed. Until Sir Ivan makes his appearance sometime near midnight guests can dance, mingle and praise and/or pillory outfits. If overtaken by thirst, whistles can be whet/wet with a passable rose sparkling wine and sun-colored Slovenia Vodka cocktails. Later, Sir Ivan's imminent arrival is heralded by several events. The drone that has been hovering for a couple of hours is behaving like a swerving dervish. Lights on the grounds and some inside are furiously blinking. And faint strains of “Here Comes the Sun” are wafting out into the sunny night. "Here Comes the Sun The Remixes': Five different versions of one song. The crowd closes in around the man of the hour as he makes for the stage. It's another light show, as flashes from cameras wink in a fury; videos are recording … It's a spectacle, a little corny. Diverting and mildly amusing. And it is rather … brief. A big buildup to a little event, that is until one does the very basic journalistic research to discover that there is more than one remix of the song. Sir Ivan does tend toward the grand gesture, after all. In New York, wags like to make a bit of fun of this congenial man, invariably referencing his rumored wild parties (orgies) and general wild lifestyle. This is certainly not the place or the time to attempt to distill truth from hearsay, gossip and … frankly, a bit of envy. Sun worshippers at Sir Ivan's record release party. Call the man what you will, he does take his music seriously, though his music may not be considered serious. The rows he hoes are “remixes of '60s love songs.” That's his schtick, his music branding message, his hook. Judging “Here Comes the Sun The Remixes” by that yardstick, one has to concede that it is a professional affair. Here is a man with the means to make it so. This is not amateur hour, and lest one forget, Sir Ivan has several hits and records under his belt. “Here Comes the Sun The Remixes” is not for music purists. Here is not high or deep art, grave meditations and serious contemplation. Yet one will be challenged not to walk away feeling a little better after listening to all five versions. Publicly anyway, Sir Ivan embraces peace and love and positivity. Lovebirds attracted to the sun? Indeed, he uses the party as the occasion to disclose that he will take a roadtrip to Los Angeles in the Peacemobile to publicize his new anti-bullying campaign. In LA, the plan is to film a video for his song, “Kiss All the Bullies Goodbye.” Co-written by Sir Ivan and produced by DJ Paul Oakenfold, the single features Taylor Dayne on vocals. Peace and love and positivity, they're all in there on “Here Comes the Sun The Remixes.” Mixers include DJ Escape, Tony Caluccio and Josh Harris. The EP is catchy, dancey, thoroughly techno and engaging. Feel good music. No crying in your beer on this one. Granted, nothing new or earth-shattering but charming. And utterly optimistic. “Here Comes the Sun The Remixes” … and I say it's all right. 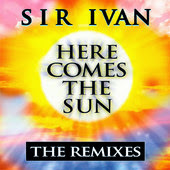 Visit http://www.sirivan.com/ to learn more about “Here Comes the Sun The Remixes”; visit http://www.bit.ly/VVlLCQ preview, buy and download any part of the EP at iTunes.